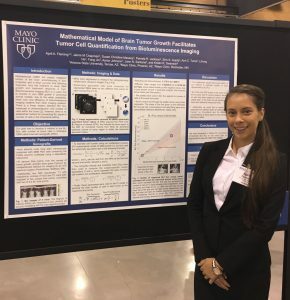 April Fleming, an ASU summer undergraduate intern with the PNT program, presented a poster on her work “Mathematical model of brain tumor growth facilitates tumor cell quantification from bioluminescence imaging”. Kyle W. Singleton, PhD, presented a poster “Comparison Of Brain Tumor Segmentation Methods For Computing Volumetric and Radial Measurements”. 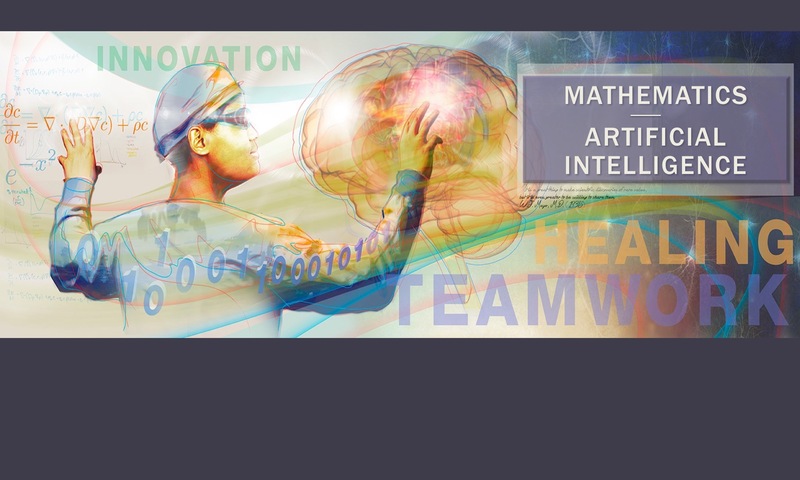 The National Institutes of Health (NIH) awarded Mayo Clinic researchers in Arizona a $3.4 million grant to study how mathematical modeling can be used to help treat patients with glioblastoma – the most common type of malignant brain cancer. Glioblastomas are made up of many different cell types and tumor cell subtypes. These cells can invade far into the brain and well beyond where the tumor can be seen on clinical imaging, such as MRIs. Surgical removal of these invasive tumor cells is risky. Yet, little is known about these residual tumor cells and how best to treat them using other treatments such as radiation or chemotherapy. Kristin Swanson, Ph.D., vice chair of research at Mayo Clinic’s Department of Neurosurgery is utilizing mathematical modeling to extract new information from MRI scans to unlock clues for how to best treat these residual tumor cells. Achieving this project requires a team with complementary skills. Swanson teamed with neuroradiologist, Leland Hu, M.D., molecular biologist, Nhan Tran, Ph.D. and imaging informaticist, Ross Mitchell, Ph.D. Using MRI data; their team produces maps of the different tumor subtypes found within a patient’s brain. “MRI-based mathematical models can be used to predict genomic content of these invasive tumor regions. These models provide a non-invasive way to identify the different tumor subpopulations in this invasive region for each patient. If we know the genetic content of the different parts of each patient’s tumor, we can match treatments that target each of the different genetic abnormalities,” says Dr. Swanson, whose team also leverages genomics, computer vision and artificial intelligence as part of their approach. 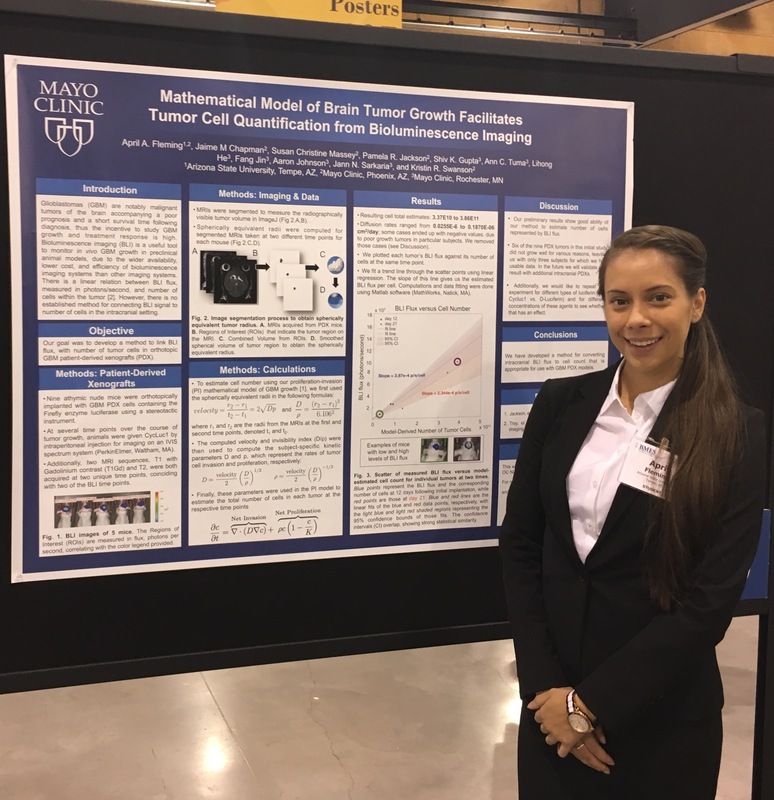 Dr. Swanson says these new mathematical models can be applied to each patient’s MRIs over time, providing crucial data on how tumor cells grow or respond to treatment in each patient. Adult gliomas are aggressive brain tumours associated with low patient survival rates and limited life expectancy. The most important hallmark of this type of tumour is its invasive behaviour, characterized by a markedly phenotypic plasticity, infiltrative tumour morphologies and the ability of malignant progression from low- to high-grade tumour types. Indeed, the widespread infiltration of healthy brain tissue by glioma cells is largely responsible for poor prognosis and the difficulty of finding curative therapies. Meanwhile, mathematical models have been established to analyse potential mechanisms of glioma invasion. In this review, we start with a brief introduction to current biological knowledge about glioma invasion, and then critically review and highlight future challenges for mathematical models of glioma invasion. Mayo Clinic and the Massachusetts Institute of Technology (MIT) have been awarded a five-year, $9.7 million grant from the National Cancer Institute (NCI) to support a Physical Sciences-Oncology Center (PS-OC). Researchers hope to learn more about the physical parameters that limit drug delivery into brain tumors and use this information to build models that will help physicians better predict how the body will distribute a particular drug to brain tumors and help them select the best drug to treat each patient based on their unique tumor. Mayo Clinic and MIT are among 10 institutions selected to participate in the NCI Physical Sciences-Oncology Network. The network supports innovative ideas that blend perspectives and approaches from the physical sciences, engineering, and cancer research, with the goal of improving the understanding of cancer biology and oncology. This article originally appeared on the Mayo Clinic News Network. Recently, two phase III studies of bevacizumab, an anti-angiogenic, for newly diagnosed glioblastoma (GBM) patients were released. While they were unable to statistically significantly demonstrate that bevacizumab in combination with other therapies increases the overall survival of GBM patients, there remains a question of potential benefits for subpopulations of patients. We use a mathematical model of GBM growth to investigate differential benefits of combining surgical resection, radiation and bevacizumab across observed tumour growth kinetics. The differential hypoxic burden after gross total resection (GTR) was assessed along with the change in radiation cell kill from bevacizumab-induced tissue re-normalization when starting therapy for tumours at different diagnostic sizes. Depending on the tumour size at the time of treatment, our model predicted that GTR would remove a variable portion of the hypoxic burden ranging from 11% to 99.99%. Further, our model predicted that the combination of bevacizumab with radiation resulted in an additional cell kill ranging from 2.6×107 to 1.1×1010 cells. By considering the outcomes given individual tumour kinetics, our results indicate that the subpopulation of patients who would receive the greatest benefit from bevacizumab and radiation combination therapy are those with large, aggressive tumours and who are not eligible for GTR. 1Clinical Research Division, Fred Hutchinson Cancer Research Center, Seattle, Washington, USA. 2Department of Medicine, 3Department of Radiology, 4Department of Neurosurgery, and 5Department of Neurology, University of Washington (UW), Seattle, Washington, USA. 6Department of Neurological Surgery and 7Northwestern Brain Tumor Institute, Northwestern University Feinberg School of Medicine, Chicago, Illinois, USA. 8Department of Pathology, Stanford University, Stanford, California, USA. 9Department of Pathology, 10Department of Biostatistics, and 11Department of Radiation Oncology, UW, Seattle, Washington, USA. 12Robert H. Lurie Comprehensive Cancer Center, Northwestern University Feinberg School of Medicine, Chicago, Illinois, USA. Address correspondence to: Hans-Peter Kiem, Fred Hutchinson Cancer Research Center, Mail Stop D1-100, P.O. Box 19024, Seattle, Washington 98109-1024, USA. Phone: 206.667.4425; E-mail: hkiem@fhcrc.org. Published August 8, 2014 Received for publication April 29, 2014, and accepted in revised form July 1, 2014. Glioblastoma, the most aggressive form of primary brain tumor, is predominantly assessed with gadolinium-enhanced T1-weighted (T1Gd) and T2-weighted magnetic resonance imaging (MRI). Pixel intensity enhancement on the T1Gd image is understood to correspond to the gadolinium contrast agent leaking from the tumor-induced neovasculature, while hyperintensity on the T2/FLAIR images corresponds with edema and infiltrated tumor cells. None of these modalities directly show tumor cells; rather, they capture abnormalities in the microenvironment caused by the presence of tumor cells. Thus, assessing disease response after treatments impacting the microenvironment remains challenging through the obscuring lens of MR imaging. Anti-angiogenic therapies have been used in the treatment of gliomas with spurious results ranging from no apparent response to significant imaging improvement with the potential for extremely diffuse patterns of tumor recurrence on imaging and autopsy. Anti-angiogenic treatment normalizes the vasculature, effectively decreasing vessel permeability and thus reducing tumor-induced edema, drastically altering T2-weighted MRI. We extend a previously developed mathematical model of glioma growth to explicitly incorporate edema formation allowing us to directly characterize and potentially predict the effects of anti-angiogenics on imageable tumor growth. A comparison of simulated glioma growth and imaging enhancement with and without bevacizumab supports the current understanding that anti-angiogenic treatment can serve as a surrogate for steroids and the clinically driven hypothesis that anti-angiogenic treatment may not have any significant effect on the growth dynamics of the overall tumor cell populations. However, the simulations do illustrate a potentially large impact on the level of edematous extracellular fluid, and thus on what would be imageable on T2/FLAIR MR. Additionally, by evaluating virtual tumors with varying growth kinetics, we see tumors with lower proliferation rates will have the most reduction in swelling from such treatments. Gliomas are notoriously aggressive, malignant brain tumors that have variable response to treatment. These patients often have poor prognosis, informed primarily by histopathology. 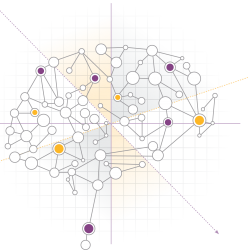 Mathematical neuro-oncology (MNO) is a young and burgeoning field that leverages mathematical models to predict and quantify response to therapies. These mathematical models can form the basis of modern “precision medicine” approaches to tailor therapy in a patient-specific manner. Patient-specific models (PSMs) can be used to overcome imaging limitations, improve prognostic predictions, stratify patients, and assess treatment response in silico. The information gleaned from such models can aid in the construction and efficacy of clinical trials and treatment protocols, accelerating the pace of clinical research in the war on cancer. This review focuses on the growing translation of PSM to clinical neuro-oncology. It will also provide a forward-looking view on a new era of patient-specific MNO. Accurate clinical assessment of a patient’s response to treatment for glioblastoma multiforme (GBM), the most malignant type of primary brain tumor, is undermined by the wide patient-to-patient variability in GBM dynamics and responsiveness to therapy. Using computational models that account for the unique geometry and kinetics of individual patients’ tumors, we developed a method for assessing treatment response that discriminates progression-free and overall survival following therapy for GBM. Applying these models as untreated virtual controls, we generate a patient-specific “Days Gained” response metric that estimates the number of days a therapy delayed imageable tumor progression. We assessed treatment response in terms of Days Gained scores for 33 patients at the time of their first MRI scan following first-line radiation therapy. Based on Kaplan-Meier analyses, patients with Days Gained scores of 100 or more had improved progression-free survival, and patients with scores of 117 or more had improved overall survival. Our results demonstrate that the Days Gained response metric calculated at the routinely acquired first post-radiation treatment time point provides prognostic information regarding progression and survival outcomes. Applied prospectively, our model-based approach has the potential to improve GBM treatment by accounting for patient-to-patient heterogeneity in GBM dynamics and responses to therapy.